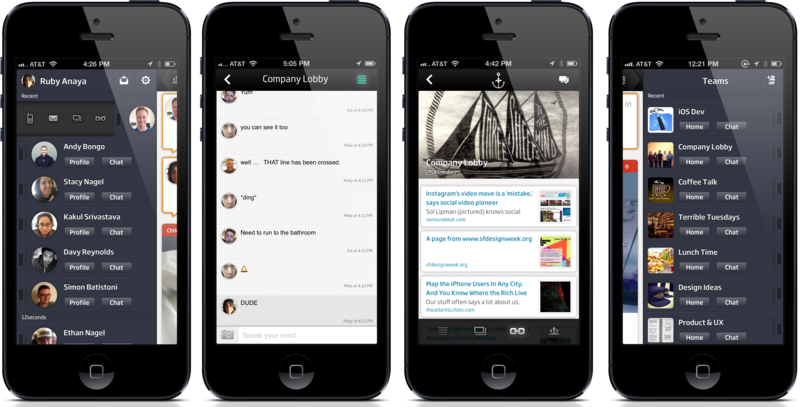 Tomfoolery, a company specializing in creating consumer-quality, mobile-first software for the enterprise, has launched its first product it calls Anchor. This app is billed as “Facebook for the workplace” and is available as both for iOS and on the Web. 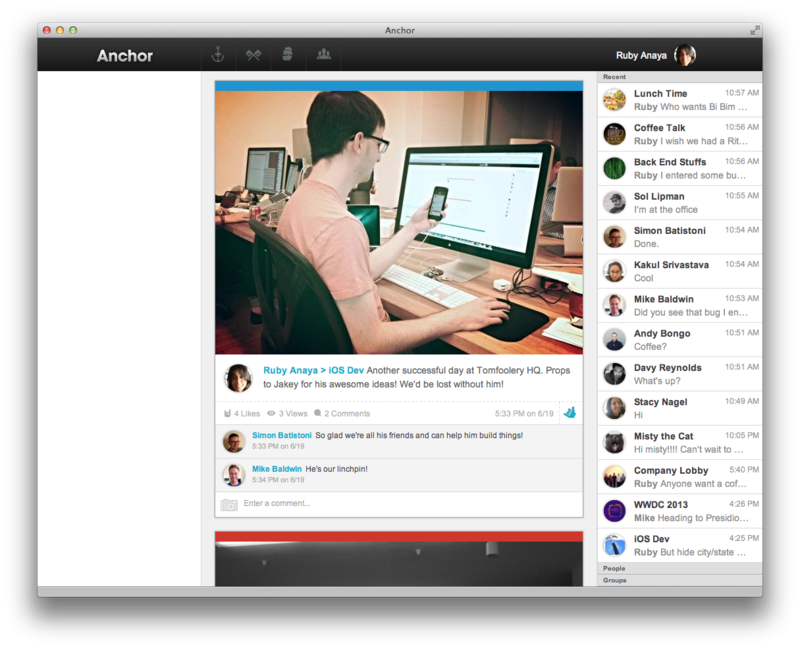 Anchor was created to help coworkers better share content with one another. Yes, it might appear that Tomfoolery has created yet another app that competes against the likes of Yammer, Jive, and Salesforce Chatter, but unsurprisingly, the company disagrees. Anchor is not intended to be a service that helps you keep track of tasks, enable collaboration, or encourage productivity. Tomfoolery says that it’s about fostering social connections with those you work with every weekday. As we spoke with Tomfoolery’s co-founder Sol Lipman, he stated the intent of Anchor and why it’s a needed social network in the enterprise. For many of us that might have accounts on services like Twitter, Path, Facebook, LinkedIn, and Google+, we might treat the content on there differently — I know that what I post on Facebook is not going to be 100 percent the same on Path, and so on. This is the dilemma Anchor hopes to resolve — creating a social network for a company in which co-workers can share thoughts, photos, and other things with each other. People at work need better tools to connect, communicate, and share. Anchor is all about bringing the same great user experiences that we’ve come to expect in our personal lives to the office. There are plenty of tools that try to help you work more efficiently. We want you to work more joyfully. How the app works is that anyone can register their company using just their work email address. It’s focused on teams and each company can have an unlimited number, whether it’s for engineers, marketing, happy hour, Friday lunches, or whatever you desire. Team members can also communicate with one another using a chat feature, but they can also take advantage of a company directory. 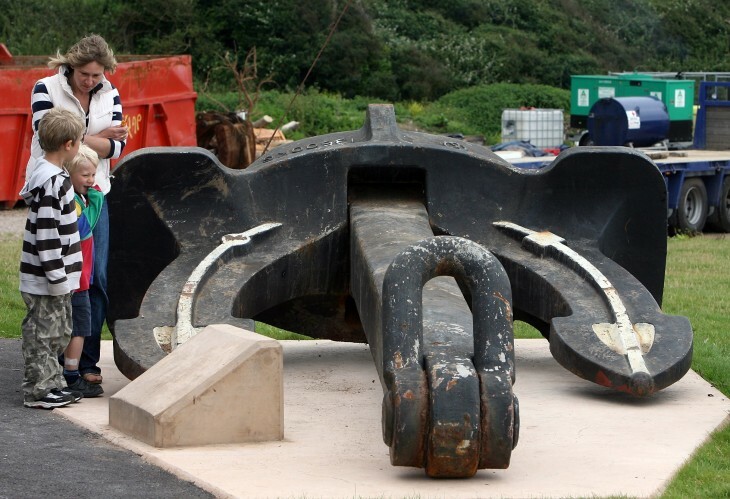 Just like any other social network, Anchor includes features to share and post links, pictures, articles, locations, videos, and anything else a company or team might want to do. Tomfoolery is looking to help bring tech services and applications that we commonly use in our everyday lives into the workplace. It thinks that Anchor has a chance and will see adoption because it’s not going after the CIOs or high-level executives for approval. Rather, it’s targeting the average worker in a company to see if they’d be interested in using it. Anchor is a free-to-use app, at least until September 25, but that date isn’t set in stone. Lipman said that there’s a chance it could become free permanently and that it might charge those services seeking to build on top of the platform — Tomfoolery isn’t quite sure what will happen, it seems. The app is available for iPhone and the Web. In a few weeks, an Android and Google Glass version will be released. Tomfoolery has raised $1.7 million in funding from Morado Ventures and others to focus on building mobile-first consumer apps for the enterprise. The idea is to create products that could help make work “awesome” — basically exploiting the concept of consumerization of IT and leveraging the decision-making power of the workers, not the executives on how to adopt technology in the workplace.